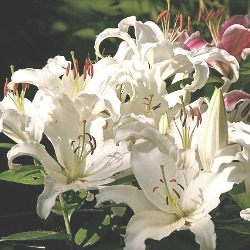 Oriental Lilies are highly valued for their beauty. They generally have very large and fragrant flowers. They are also excellent cut flowers and ideal for pots. Oriental varieties are late flowering and have 6-10 exotic blooms. Protect in cold climates with a thick mulch. Siberia Oriental Lily has pure white large, ruffle-edged flowers that face outward. Each stem has 3-5 blooms. For Fall Planted Oriental Lily bulbs please click here. Gorgeous! One of our most popular. 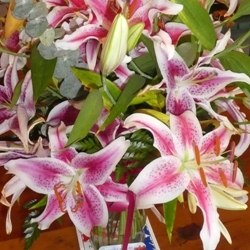 The Stargazer Oriental Lily is well known for its delicate scent and rich color. Deep raspberry red flowers with white margins.